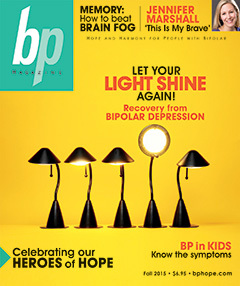 I noticed BP Magazine in one of my Facebook feeds the other day and was up reading a few articles from the site last night. In each piece, I felt like I was reading about myself. That rarely happens to me. The world is full of Martians, and I'm one of the last humans left. My first thought, as I read a sampling of the articles that are available online without a subscription, was what I'll call surprise. I thought, whoa, why didn't anyone tell me this before. People with the same experiences and struggles as I've had. The same symptoms, the same failures. Parenting while unstable. Memory and focus issues. Depression, insomnia, suicidality, dissociation. Periods of creativity and periods of the-opposite-of-creativity. I find myself wishing that I could be more specific, directly quote even, exactly what spoke to me -- I can hear one of my counselors asking, refusing to accept my I-don't-know shrug even though it's perfectly true. At a mental health seminar I attended earlier this Fall, I asked if it was worthwhile to pursue a definite diagnosis. I was pretty frustrated at the time, feeling that my counseling would be indefinite and lead to nowhere. With the remarkable number of named disorders and the apparent similarities between them, I thought there was little to no value in being labeled. I was wrong about that. It is worthwhile. In another post I will explain more of the process of finding a counselor and getting a diagnosis.